Be sure to stock up on hotel room key holders for placement inside of your individual guest rooms, so patrons can have one convenient location to place their electronic keys. These products easily mount to the wall with double-sided tape and are available in clear or black to complement your room’s decor. 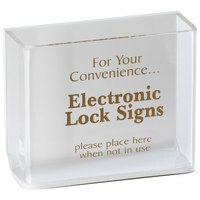 Best of all, these holders prevent your guests from misplacing or forgetting their room keys. Also make sure to check out other great items from Cal-Mil. 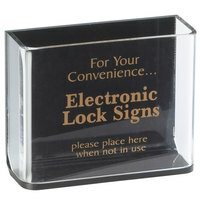 plusCal-Mil ESH-W White Electronic Key Holder with Mounting Tape - 3 1/2" x 3/4" x 4"
plusCal-Mil ESH-B Black Electronic Key Holder with Mounting Tape - 3 1/2" x 3/4" x 4"
By providing your guests with simple amenities like hotel room door signs and key holders, they’ll feel more welcomed and organized during their stays. These signs make it easy for your customers to communicate with your cleaning staff, so their privacy is always honored. 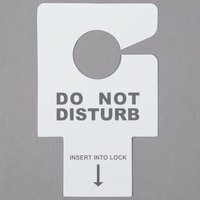 It’s also convenient that these signs can be easily hung on the door’s knob or inserted into its electronic key slot. For other great supplies for your establishment, be sure to check out our hotel room coffee makers, ironing and laundry supplies, and folding luggage racks. If you're wondering where to buy hotel room door signs and key holders, we have a large selection of hotel room door signs and key holders for sale at the lowest prices.